Auto Loan Rates Now at Eight-Year Highs - Cox Automotive Inc. Unlike mortgage rates, auto rates have not gone down; in fact, so far they have gone up in April! Through April 1, the average new auto loan rate was 6.55 up 66BPs from last year. The average used loan rate was 10.84, up 63 BPs from last year. The increase in auto loan rates and vehicle prices are causing payments to grow even faster. Through March, average new finance payments are up 3.4% to $567, average lease payments are up 2.7% to $500,and average used loan payments are up less than 1% to $414. One of the most intriguing trends for the year is what has happened and is happening with interest rates. At the end of last year, the Fed remained hawkish and very resolute about pushing rates higher in 2019. After a stock correction, they turned to patience as the mantra. And this month the yield curve inverted. The graphic below illustrates what has been happening in key rates. The Fed controlled Discount Rate reached its new peak of 3% in December when the Fed last raised. 10-year treasuries peaked in October and declined throughout March before moving back up last week. 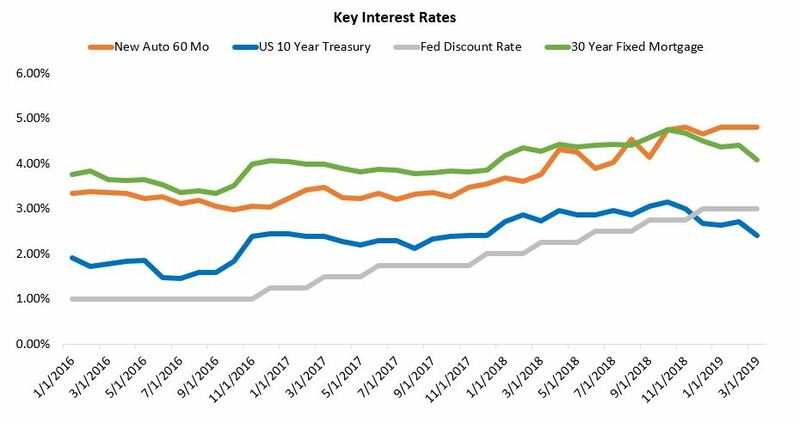 The steep declines in March resulted in a yield curve inversion, which occurs when shorter duration yields like on three-month Treasuries exceed yields on longer Treasuries like the 10 year. The 10Y-3M spread turned negative in March for the first time since 2007. Mortgage rates followed the declines in the 10-year, making home buying more attractive. Even though bond yields are now higher by about 15 basis points and enough to push the 10-year back above the three-month mortgage rates have moved less and they remain lower than they were a year ago. Auto rates by contrast have not gone down. In fact, so far they have gone up in April! We see that reflected in the best available rates as measured by Bankrate.com and shown here but also in real rates we can track on Dealertrack. Through April 1, the average new auto loan rate was 6.55 up 66BPs from last year. The average used loan rate was 10.84, up 63 BPs from last year. The increase in auto loan rates and vehicle prices are causing payments to grow even faster. Through March, average new finance payments are up 3.4% to $567, average lease payments are up 2.7% to $500,and average used loan payments are up less than 1% to $414. As a result of multiple years of rate and price inflation, new vehicles payments are far less attractive than used. The auto loan rate trend continues to be a negative for new vehicle sales.